A key component of the NASFAA Leadership & Legislative Conference & Expo is the opportunity to visit with your elected officials on Capitol Hill. 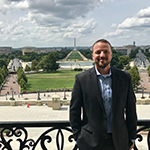 Every year, conference participants provide their perspective to members of Congress and their staff about federal financial aid policy and opportunities to improve the federal aid system. If you are planning to visit Capitol Hill to meet with your state representatives, you are required to watch our "Preparing For Your Hill Visit" webinar, which aired live on Jan. 29, 2019, before coming to D.C. This NASFAA webinar was designed to give members who have scheduled Hill visits as a part of the Leadership & Legislative Conference & Expo an opportunity to understand key policy topics prior to respective visits. We also encourage you to do a little research before coming to Washington in order to prepare for your meetings. Visit the NASFAA Advocacy pages on NASFAA.org to familiarize yourself with the issues. Your on-the-ground perspective is invaluable to legislators and their staff. You also may want to visit the websites of your members of Congress to better understand their positions on education issues, which committees they sit on, and how they have voted on major pieces of legislation related to education.